LEXINGTON, Ky. – David Faas and his wife, Connie, began Davco Welding Ltd. as a small welding business in Wainwright, Alberta, Canada in 1981. 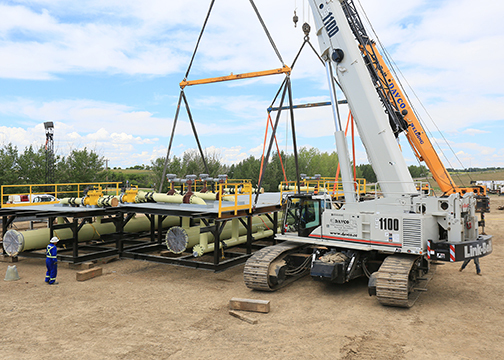 Now, a turnkey operation for oil field companies, Davco builds fabricated, modular components or “mods” on its 32 acre site in Wainwright, before transporting the mods to oil refineries where they are used to update existing oil terminal and pipeline facilities. One of the busiest locations for Davco is the Hardisty Terminal where the Keystone XL oil pipeline begins a network of oil product distribution from northern British Columbia and Alberta to eastern Canada and abroad. Davco crews have taken a real liking most recently to the TCC-1100 primarily for lifting and logistical purposes. According to Faas, the TCC-1100 travels throughout his property, to and from designated lifting spots quickly and easily. Standard square metal tubing or H-beams are cut into various lengths and welded together and maneuvered with smaller cranes like the Link-Belt RTC-8050 Series II. Once welded into larger, structural pieces, the TCC-1100 takes over to load and unload trucks carrying the large weldments to various facilities, including Hardisty Terminal. The TCC-1100 always moves lift ready, because there are no outriggers or cribbing required. If the unit needs to move several feet or acres with its load, it can and does so easily, and it makes for a very efficient tool for Faas and Davco. In some instances structures weigh up to 150,000 lbs. and a 90-ton HTC-8690 is used in combination with the TCC-1100 to lift the structures in tandem on to a trailer for transport. “Since we needed a crane to lift pieces that never seemed to be on a set schedule, we looked at purchasing our own cranes as a way of controlling costs. We had a choice between Link-Belt and another manufacturer. The Link-Belt people along with the dealer, ES&S, seemed to treat us better. We have had good luck with the cranes and the dealer, so we stayed with Link-Belt,” explained Faas.